← I love these healing waters! Art Journal Meditation created from simple techniques lets us savor Beauty. Beauty heals my soul! Experiencing Beauty in nature, in a garden, in a smile, is like water to a thirsty woman. Sometimes I don’t realize how dehydrated I am until I start to drink. My goal in starting The Quiet Garden Retreat was to create a space for women to experience Beauty with all their senses, feel safe to create Beauty in new ways, and to recognize the real Beauty inside themselves. So often we don’t take the time to breathe deeply, release, and surrender to Beauty. 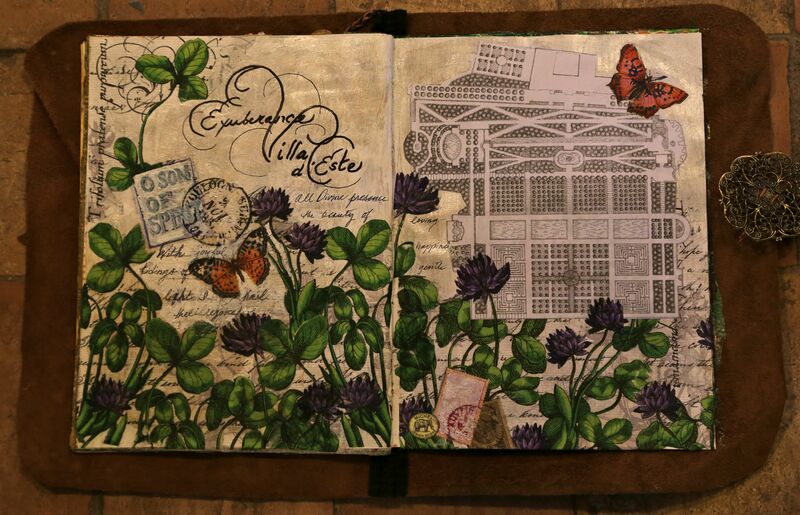 This art journaling page was created by a participant at our February 2015 retreat using simple techniques to express the experience of visiting a garden. Each day we visited a new place and returned to our farmhouse villa to create based on the metaphors we experienced. Villa d’Este gushes, overflows, explodes with exuberance – fountains of water in almost every size and shape tumble down the hillside. 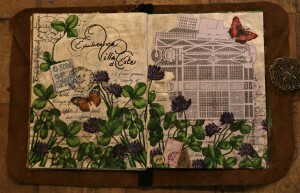 This journal page expresses that same vitality in life and abundance. It was created with a copy of the garden plan, images from napkins, some paint and pens. No drawing skill required. Lots of joy shared! Contact me if you would like to share this experience at our May 2016 retreats.